The rooms provided for boarders are of the highest quality. The Boarding staff expect boys to take pride in their rooms. Rooms must be kept tidy at all times. Beds should be made daily and clothes, towels and personal belongings must be kept off the floor to enable the cleaning staff to keep the rooms hygienic. Rooms will be inspected regularly. More thorough room inspections will take place throughout the year. These room inspections will be recorded and performed with both the boarder of the room being inspected, and another staff member or senior boarder present. There are a number of factors that influence the distribution of rooms in the Boarding House. Further factors that will influence rooming include the number of years a boarder has been in the House, as well as academic effort and how well a boarder keeps his room/space. Rooming is organised at the Head of Boarding’s discretion. Students are free to bring items to help make their bedroom area ‘their own’. This may include simple things like bringing one’s doona cover from home, or a selection of posters to put up using blu-tack. Please note that there does need to be an appropriate level of decency across the House and in keeping with our philosophy of respecting women; “scantily clad” shots of girls are deemed inappropriate. The House is fortunate enough to have insulation to dampen the surrounding aircraft noise and this means that each room has been fitted with air-conditioning. It is important to realise that while each room has its own outlet, up to three rooms will share the outside ‘fan’ unit. This means that each bedroom needs to be set to the same ‘setting’ e.g. “cooling”, “heating”, “dehumidify” etc. If your air conditioning doesn’t appear to work (the green light flashes), ensure that the rooms that share your outside unit are all on the same setting. If not, change the settings to the same, turn all the conditioners off with their remote and turn on again. It is important for students not to overuse the air conditioners – particularly when the weather is temperate – in keeping with trying to reduce unnecessary energy consumption and broader environmental concerns. Students must ensure that air conditioners are switched off whenever they leave their bedroom (using the ‘timer’ setting on the remote is a good way of addressing this). The Boarding House is well-equipped with facilities to cater to the boys’ needs. 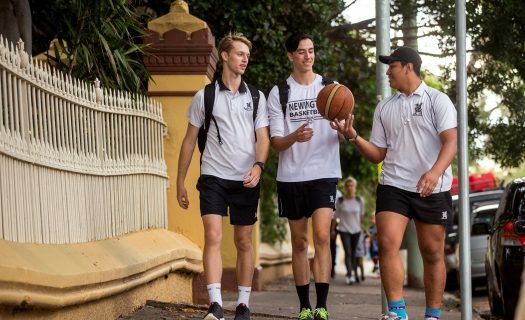 The Boarding House is well-equipped with facilities to cater to the boys’ needs. With full laundry facilities, air-conditioning in each of the rooms and a recently upgraded hot water system, the Boarding House is a comfortable place to live with all the necessary amenities. Bulky items such as computer boxes and luggage may be stored in the Bag Store, located on the ground floor near the laundry. A limited number of items may be stored at the end of Terms 1, 2 and 3. All items must be clearly named or labeled and packed neatly into boxes or bags. All items are to be removed at the end of each year, when boarders go home. 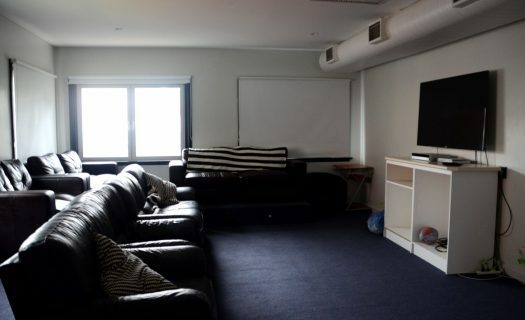 The TV room is located near the dining area and is equipped with a wall-mounted plasma television, Apple TV and Foxtel. Boarders are able to use the room when they have free time. Food is NOT to be taken into the TV room unless specifically sanctioned by the Master-on-Duty (usually in relation to a particular occasion). The College currently offers wireless connectivity to the Internet. Boys are able to access the Internet between the hours of 6:00 AM and 10:30 PM. Boys are NOT to bring wireless ‘dongle’ devices of their own, which cannot be monitored by the College’s internet filter. Any devices found will be confiscated and/or sent home to parents. Parents should be aware that most mobile telephone devices now offer a “hotspot” function, which allows the phone to act as a wireless internet hub. The College is unable to monitor this usage and recommends that parents disable this function or put restrictions in place to limit their son’s download. Boarders are expected to sign and abide by the Information Technology Agreement. Should boys experience difficulties with connecting to the network, they should contact the IT department at school during the school day. The Boarding community takes its security very seriously. As a precaution, boys should bring a lock (a spare key can be given to the Head of Boarding if necessary) for use on their wardrobe in order to help safeguard valuables. In addition to this, details of ‘expensive’ items (laptops/computers, cameras, mobile phones etc) including serial numbers should be kept in a safe place. Boys are reminded that storing large sums of money is inappropriate (see Money). No student should give the boarders’ door code to another person as this compromises the safety of all individuals in the Boarding community. All outsiders, including parents, guardians and friends must report to the Master-on-Duty. Upon entry, all items are brought into the House at the owner’s risk; students may wish to consider whether personal insurance is appropriate in their circumstances. Boys will be issued with a security code at the beginning of each term. This will allow them access to the House between 6:00 AM–8:00 AM and 3:30 PM–10:00 PM on weekdays and 7:00 AM–10:00 PM on weekends. If a boy suspects that there is somebody in the Boarding House who should not be there then he must inform the Master-on-Duty ASAP. If he ever suspects that there is somebody illegally in the school grounds then he should inform a Boarding Master-on-Duty or a trusted adult. Adults who are in the House must report to the Master-on-Duty who can be reached by calling 555 from the telephone in the foyer. Students are responsible for their own private banking arrangements. There are a number of ATMs located near the Boarding House to withdraw funds. These include banks located on Enmore Rd, the ‘supermarket’ on the other side of the railway line and via an EFTPOS purchase from the IGA on Holt Street. Boys should keep only ‘necessary’ cash locked up in the House. If they do have more cash than necessary they can leave it with the Head of Boarding who will distribute it to the boarder when requested. Only ‘small’ amounts of money should be kept in the Boarding House at any time – sufficient to make small purchases (i.e. $10 – $20). Wallets (and other valuables) should preferably be in the possession of a student, but when this is not practical, should always be kept locked in a student’s wardrobe. Please note: boys are NOT allowed to use the ATM in the Bottle shop on Cambridge Street and should not enter this venue (or any other licensed venue such as pubs or bars). Boys may bring and ride their own bikes. Parents must sign a form stating that they provide permission for the boy to ride and that they agree that he must follow the necessary rules and that riding is at one’s ‘own risk’. These are available from the Head of Boarding. Boys MUST wear (in keeping with NSW laws) an appropriate helmet when riding, as well as the necessary lights if riding in the dark. Boys are expected to observe all applicable road rules when riding. Scooters and skateboards may be similarly brought to the House. They must not be ridden on the road, including so called ‘quiet’ streets. Failure to observe any rules or safety requirements, will see the bike/scooter/skateboard being confiscated or the privilege being removed. Boarders can bring their own laptops and electronic devices and also have access to the school's resources. All such equipment is brought into the Boarding House “at your own risk”. Items may be kept in the Bag Store in Edmund Webb, provided that such items are labeled and stored appropriately. All electronic devices must be put away by “lights out” with the exception of laptop computers if the student is studying or completing assignments. Failure to do so will result in a period of confiscation. Inappropriate use of any electronic equipment will result in it being confiscated or sent home. Small valuables, such as iPods, iPads and smartphones, should be securely locked away or given to the Head of Boarding, if a student will be away for a period of time. Boarders are expected to sign and abide by the Information Technology Agreement.